May 11, 2015: One day, when humans go to Mars, they might find that, occasionally, the Red Planet has green skies. In late Dec. 2014, NASA's MAVEN spacecraft detected evidence of widespread auroras in Mars's northern hemisphere. The "Christmas Lights," as researchers called them, circled the globe and descended so close to the Martian equator that, if the lights had occurred on Earth, they would have been over places like Florida and Texas. "It really is amazing," says Nick Schneider who leads MAVEN's Imaging Ultraviolet Spectrograph (IUVS) instrument team at the University of Colorado. 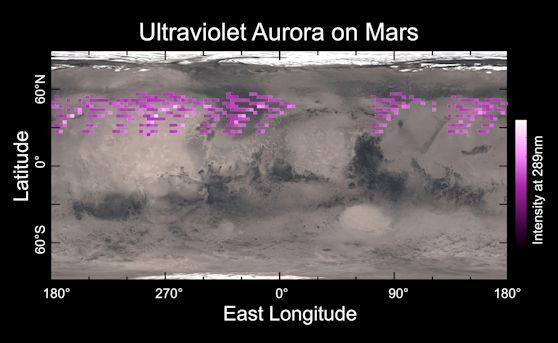 "Auroras on Mars appear to be more wide ranging than we ever imagined." This isn't the first time a spacecraft has detected auroras on Mars. Ten years ago, the European Space Agency's Mars Express found an ultraviolet glow coming from "magnetic umbrellas" in the southern hemisphere. Unlike Earth, Mars does not have a global magnetic field that envelops the entire planet. Instead, Mars has umbrella-shaped magnetic fields that sprout out of the ground like mushrooms, here and there, but mainly in the southern hemisphere. These umbrellas are remnants of an ancient global field that decayed billions of years ago. "The canopies of the patchwork umbrellas are where we expect to find Martian auroras," says Schneider. "But MAVEN is seeing them outside these umbrellas, so this is something new." Auroras occur, both on Earth and Mars, when energetic particles from space rain down on the upper atmosphere. On Earth, these particles are guided toward the poles by our planet's global magnetic field. That's why auroras are seen most often around the Arctic and Antarctic. On Mars, there is no organized planetary magnetic field to guide the particles north and south—so they can go anywhere. "The particles seem to precipitate into the atmosphere anywhere they want," says Schneider. "Magnetic fields in the solar wind drape across Mars, even into the atmosphere, and the charged particles just follow those field lines down into the atmosphere." According to the MAVEN data, solar particles that caused the "Christmas lights" penetrated deeply into the Martian atmosphere---sparking auroras less than 100 km from the surface. That's lower than auroras on Earth, which range from 100 km to 500 km high. Like Mars Express 10 years ago, MAVEN has an ultraviolet camera, so it is not seeing the same thing as human eyes. What would a human see? Schneider isn't certain. "We’re still doing the physics," he says, "but we have some educated guesses." Although the Martian atmosphere is primarily CO2, it does contain some oxygen--and that is key to the color of the auroras. Excited oxygen atoms in the Martian atmosphere would likely produce green light. "A diffuse green glow seems quite possible in the Mars sky, at least when the Sun is throwing off energetic particles," says Schneider. MAVEN arrived at Mars in Sept. 2014 on a mission to investigate a planetary mystery: Billions of years ago, Mars was blanketed by layer of air massive enough to warm the planet and allow liquid water to flow on its surface. Life could have thrived in such an environment. Today, however, only a tiny fraction of that ancient air remains, leaving Mars a desiccated wasteland. Where did the Martian atmosphere go? A favorite theory is solar wind erosion. Because Mars no longer has a global magnetic field to protect it, solar wind might strip away material from the upper layers of the atmosphere. Watching the auroras could help MAVEN mission scientists learn more about this process. "Plus," says Schneider, who is looking forward to future data, "I just love auroras."